Calle Sebastian, a painting of Philippine street by José Honorato Lozano best known for pioneering Filipino paintings which combines East and West style especially Spanish baroque of Spanish art and Late imperial Chinese art. The art of the Philippines refers to the works of art that have developed and accumulated in the Philippines from the beginning of civilization in the country up to the present era. Inspirations on the enhancement of Philippine arts in the pre-colonial era were usually the belief systems of the native people and the natural world. Colonialism shifted the inspirations of Philippine art towards Western notions of "art". Since the independence era, inspirations of Philippine art has shifted into more indigenous roots, notably, through Philippine mythology. Philippine art reflects to its society and non-Filipinos the wide range of cultural influences on the country's culture and how these influences honed the country's arts. The art of the Philippines can be divided into two distinct branches, namely, traditional arts, and non-traditional arts. Each branch is further divided into various categories with subcategories. (A) Traditional arts - bearers of traditional arts can be nominated as Gawad Manlilikha ng Bayan (GAMABA), equal to National Artist. (B) Non-traditional arts - bearers of non-traditional arts can be nominated as National Artist, equal to Gawad Manlilika ng Bayan. Kut-kut is a technique combining ancient Oriental and European art process. Considered lost art and highly collectible art form. Very few known art pieces existed today. The technique was practiced by the indigenous people of Samar Island between early 1600 and late 1800 AD. Kut-kut is an exotic Philippine art form based on early century techniques—sgraffito, encaustic and layering. The merging of these ancient styles produces a unique artwork characterized by delicate swirling interwoven lines, multi-layered texture and an illusion of three-dimensional space. The Golden Tara of Agusan. Many of historians believe that the various cultures of the Philippine archipelago first encountered Hindu and/or Buddhist beliefs as early as the 2nd and 3rd centuries BCE, but some recent scholars suggest that these cultural influences filtered in mostly during the 10th through the early 14th centuries. Present-day scholars believe these religious and cultural influences came mostly through trade with Southeast Asian thassalocratic empires such as the Srivijaya and Majapahit, which in turn had trade relationships with India. Scholars such as Milton Osborne emphasize that despite these beliefs being originally from India, they reached the Philippines through Southeast Asian cultures with Austronesian roots. The artifacts reflect the iconography of the Vajrayana Buddhism and its influences on the Philippines' early states. The copper Buddha's of Ma-i (metal relics) – "The gentleness of Tagalog customs that the first Spaniards found, very different from those of other provinces of the same race and in Luzon itself, can very well be the effect of Buddhism "There are copper Buddha's" images. the people in Ma-i sound like newcomers [to this port] since they don't know where those metal statues in the jungle come from." The archipelagos of Southeast Asia were under the influence of Hindu Tamil, Gujarati and Indonesian traders through the ports of Malay-Indonesian islands. Indian religions, possibly an amalgamated version of Hindu-Buddhist arrived in the Philippine archipelago in the 1st millennium, through the Indonesian kingdom of Srivijaya, followed by Majapahit. Archaeological evidence suggesting exchange of ancient spiritual ideas from India to the Philippines includes the 1.79 kilogram, 21 carat gold Hindu goddess Agusan (sometimes referred to as Golden Tara), found in Mindanao in 1917 after a storm and flood exposed its location. The statue now sits in the Field Museum of Natural History in Chicago, and is dated from the period 13th to early 14th centuries. A study of this image was made by Dr. F. D. K. Bosch, of Batavia, in 1920, who came to the conclusion that it was made by local workmen in Mindanao, copying a Ngandjuk image of the early Majapahit period – except that the local artist overlooked the distinguishing attributes held in the hand. It probably had some connection with the Javanese miners who are known to have been mining gold in the Agusan-Surigao area in the middle or late 14th century. The image is apparently that of a Sivaite goddess, and fits in well with the name "Butuan" (signifying "phallus"). Juan Francisco suggests that the golden Agusan statue may be a representation of goddess Sakti of the Siva-Buddha (Bhairava) tradition found in Java, in which the religious aspect of Shiva is integrated with those found in Buddhism of Java and Sumatra. The Rajahnate of Butuan, in present-day Agusan del Norte and Butuan City, used Hinduism as its main religion along with indigenous Lumad nature-worships. A Hindu Tamil King of the Rajahnate of Cebu was also recorded. Another gold artifact, from the Tabon Caves in the island of Palawan, is an image of Garuda, the bird who is the mount of Vishnu. The discovery of sophisticated Hindu imagery and gold artifacts in Tabon Caves has been linked to those found from Oc Eo, in the Mekong Delta in Southern Vietnam. These archaeological evidence suggests an active trade of many specialized goods and gold between India and Philippines and coastal regions of Vietnam and China. Golden jewelry found so far include rings, some surmounted by images of Nandi – the sacred bull, linked chains, inscribed gold sheets, gold plaques decorated with repoussé images of Hindu deities. In 1989, a laborer working in a sand mine at the mouth of Lumbang River near Laguna de Bay found a copper plate in Barangay Wawa, Lumban. This discovery, is now known as the Laguna Copperplate Inscription by scholars. It is the earliest known written document found in the Philippines, dated to be from the late 9th century CE, and was deciphered in 1992 by Dutch anthropologist Antoon Postma. The copperplate inscription suggests economic and cultural links between the Tagalog people of Philippines with the Javanese Medang Kingdom, the Srivijaya empire, and the Hindu-Buddhist kingdoms of India. Hinduism in the country declined when Islam was introduced by traders from Arabia which was then followed by Christianity from Spain. This is an active area of research as little is known about the scale and depth of Philippine history from the 1st millennium and before. Three designs of Lingling-o at the Musée du quai Branly in Paris, France. The Lingling-o (sometimes also spelled "ling-ling-o") are an "omega shaped" type of pendant or amulet that has been associated with various indigenous cultures of the Philippines since the early metal age. The earliest surviving examples of lingling-o, dating back to the metal age, were made out of Nephrite jade, but many later examples were made of shell, gold, copper, and wood; the kind of material suggests differences in the social standing of its wearer. The term was first popularized by H. Otley Beyer, who adapted it from the Southern Ifugao name for such ornaments. The term has since also come to be used as a blanket term for various metal age ornaments found in the Philippines, Taiwan, and Vietnam. Earlier historians have posited that the earliest lingling-o artifacts found in the Philippines were created outside of the archipelago, but an expedition to the northern Philippine province of Batanes, led by archeologist Peter Bellwood in the early 2000s, led to the discovery of a lingling-o workshop, complete with construction tools and fragments. The find provides evidence of indigenous Philippine manufacture of lingling-o as early as 2,500 years ago. The vernacular architecture of the Philippines is diverse and developed according to the traditions, history and influences exposure experienced by each culture or society. They ranged from simple Bahay Kubo which is the basis of all Filipino cultural architecture which gave way to houses like Bahay na bato, up to the palaces such as Torogans, fortifications like the Classical Kota's and Idjangs, Colonial Forts and mega structure such as Banaue Rice Terraces which is built from carving of the mountain walls, and Mosques in Mindanao. Architectures like Baroque was adopted to the Filipino culture, making their own interpretation through the Filipino culture climate and environment. One of the product of Filipino Baroque is the Earthquake Baroque, which is especially designed to adapt to the earthquake prone environment of the Philippines. A Filipino loom for weaving rough fabrics of abaka fiber, 1905. Philippine weaving involves many threads being measured, cut, and mounted on a wooden platform. The threads are dyed and weaved on a loom. Before Spanish colonization, native Filipinos weaved using fibers from abaca, cotton, and bark cloth. Textiles, clothes, rugs, and hats were weaved. Baskets were also weaved and used as vessels of transport and storage, and for hunting. These baskets were used to transport grain, store food, and catching fish. They also used weaving to make just about all of the clothing that was worn. They weaved rugs that they used for quilts and bedding. The quality of the quilt/bedding was based on how soft, how tight together, and the clean pattern. The patterns were usually thick stripes with different colors and with a nice pattern. However, during Spanish colonization, Filipinos used fabric called nipis to weave white clothing. These were weaved with decorative, flower designs. Prehistoric cave drawings were discovered in a number of sites in the Philippines. A notable set is the Angono Petroglyphs, found in a shallow rock shelter. It measures 63 meters wide, 8 meters deep, and a maximum height of 5 meters. These were formed in volcanic soil during the Quaternary period. There are 127 drawings in forms of animate and static figures with circular or dome-like heads on top of a 'V' shaped torso. The drawings are distributed on a horizontal plane on a rock wall area measuring 25 meters by 3 meters. Only 51 of the total 127 drawings are distinct. Due to the complexity and plurality of the drawings, it is suggested that the drawings were not only created by a single individual. the figures engraved on the rockwall were probably carved during the late Neolithic, or before 2000 BC. These inscriptions clearly show stylized human figures, frogs and lizards, along with other designs that may have depicted other interesting figures. Erosion may have caused some to become indistinguishable. The engravings are mostly symbolic representations and are associated with healing and sympathetic magic. Artistic paintings were introduced to Filipinos in the 16th century when the Spaniards arrived. During this time, the Spaniards used paintings as visual aids for their religious propaganda of spreading Catholicism. These paintings, appearing mostly on church walls, featured religious figures that appear in Catholic teachings. The purpose of most paintings in the Philippines from the 16th to the 19th century were to aid the Catholic Church. In the early 19th century, wealthier, educated Filipinos introduced more secular Filipino art, causing art in the Philippines to deviate from religious motifs. 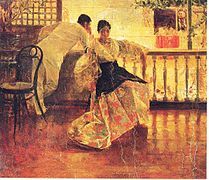 The use of watercolour paintings increased and the subject matter of paintings began to include landscapes, Filipino inhabitants, Philippine fashion, and government officials. Portrait paintings featured the painters themselves, Filipino jewelry, and native furniture. Landscape paintings portrayed scenes of average Filipinos partaking in their daily tasks. These paintings often showcased ornately painted artists' names. These paintings were done on canvas, wood, and a variety of metals. During World War II, some painters focused their artwork on the effects of the war. Common themes included battle scenes, destruction, and the suffering of the Filipino people. The Philippines has numerous indigenous scripts collectively called as suyat. Various ethno-linguistic groups in the Philippines prior to Spanish colonization in the 16th century up to the independence era in the 21st century have used the scripts with various mediums. By the end of colonialism, only four of the suyat scripts survived and continue to be used by certain communities in everyday life. These four scripts are hanunó'o/hanunoo of the Hanuno'o Mangyan people, buhid/build of the Buhid Mangyan people, apurahuano/tagbanwa of the Tagbanwa people, and palaw'an/pala'wan of the Palaw'an people. All four scripts were inscribed in the UNESCO Memory of the World Programme, under the name Philippine Paleographs (Hanunoo, Buid, Tagbanua and Pala’wan), in 1999. Due to dissent from colonialism, many artists and cultural experts have revived the usage of suyat scripts that went extinct due to Spanish persecution. These scripts being revived include the kulitan script of the Kapampangan people, the badlit script of various Visayan ethnic groups, the iniskaya script of the Eskaya people, the baybayin script of the Tagalog people, and the kur-itan script of the Ilocano people, among many others. Calligraphy using the Western alphabet and the Arabic alphabet are also prevalent in the Philippines due to its colonial past, but the Western alphabet and the Arabic alphabet are not considered as suyat, and therefore Western alphabet and Arabic calligraphy are not considered as suyat calligraphy. The Butuan Ivory Seal, dated 1002 AD, housed and displayed at the National Museum of Anthropology in Manila. Like Mongolia, Taiwan, China, Japan and Korea, the Philippines also had a sealing culture prior to Spanish colonization, which is reasonable as the Philippines is within the Sinosphere, or East Asian cultural sphere. However, when the Spaniards succeeded in colonizing the islands, they abolished the practice and burned all documents they captured from the natives while forcefully establishing a Roman Catholic-based rule. Records on Philippine seals were forgotten until in the 1970s when actual ancient seals made of ivory were found in an archaeological site in Butuan. The seal, now known as the Butuan Ivory Seal, has been declared as a National Cultural Treasure. The seal is inscribed with the word "Butwan" through a native Suyat script. The discovery of the seal proved the theory that pre-colonial Filipinos, or at least in coastal areas, used seals on paper. Before the discovery of the seal, it was only thought that ancient Filipinos used bamboo, metal, bark, and palm leaves (lontar) for writing. The presence of paper documents in the classical era of the Philippines is also backed by a research of Dr. H. Otley Beyer, father of Philippine anthropology, stating that Spanish friars 'boasted' about burning ancient Philippine documents with suyat inscriptions, one of the reasons why ancient documents from the Philippines are almost non-existent in present time. The ivory seal is now housed at the National Museum of the Philippines. Nowadays, younger generations are trying to revive the usage of seals, notably in signing pieces of art such as drawings, paintings, calligraphy, and literary works. Additionally, traditional handmade paper-making practices using native fibers, such as abaca, cogon, and pina have been revived by numerous organizations throughout the country. The religion of the Ifugao people is based on ancestor worship and the veneration of spirits and gods of nature. Rice deities are particularly revered. These bululs are activated through ritual, the bulol guardian figures are believed to contain spirits capable of ensuring abundant harvests, increasing rice yields and protecting against catastrophe. Shaped like a rice mortar, the distinctive base of the sculpture is a visual link to its spiritual purpose. The pairing of male with female is a fundamental feature of Cordilleras ancestral art. These Bulul guardians represent the harmonious union of opposing elements, the protection of communities from malevolent spirits and the promise of good fortune. Carved from auspicious red sandalwood, these sculptures are differentiated by their distinct genitalia, alluding to fertility and abundance. The figures have a rich patina of sacrificial blood and smoke resulting from their use in religious practice and life-cycle ceremonies. A Bul-ul is a carved wooden figure used to guard the rice crop by the Ifugao (and their sub-tribe Kalanguya) peoples of northern Luzon. The sculptures are highly stylized representations of ancestors, and are thought to gain power from the presence of the ancestral spirit. The Ifugao are particularly noted for their skill in carving bululs. Bul-uls are used in ceremonies associated with rice production and with healing. Creation of a bul-ul involves alwen bul-ul ritual by a priest to ensure that the statue gains power. The bul-ul is treated with care and respect to avoid the risk of the spirits of the ancestors bringing sickness. The figures are placed together with the rice in the house or granaries to bring a plentiful harvest. Bul-ul is important to Ifugaos because they believe they can protect and multiply the rice and help make the harvest abundant. The Sarimanok is a legendary bird of the Maranao people who originate from Mindanao. It comes from the words sari and manok. Sari means cloth or garment, which is generally of assorted colors. Manok means "chicken". The Sarimanok is the legendary bird that has become an ubiquitous symbol of Maranao art. It is depicted as a fowl with colorful wings and feathered tail, holding a fish on its beak or talons. The head is profusely decorated with scroll, leaf, and spiral motifs. It is said to be a symbol of good fortune. And another example of Maranao sculpture was in the Islamic tradition; the Buraq is often described as "a white animal, half-mule, half-donkey, with wings". The Prophet Muhammad rode the Buraq to fly through the heavens in a single night, a journey known as Mir'aj. Only in certain regions, such as Mindanao, is the animal depicted with a human face. Although the Buraq is not uncommon in Islamic art, sculptures of the creature seem to be unique to the Philippines. It is possible that the flourishing carving industry of religious images for Catholic Filipinos may have encouraged the making of such sculptures. A bulul guardian figure. Wine server of the Ifugao people. Wood and sacrificial remains, northern Luzon, c. 15th century. Sculpture of Buraq unique to Mindanao Muslims in the Philippines. Carvings in Miagao Church in Iloilo describes daily life, culture and nature of the Filipinos. A fine example of Filipino baroque art. Filipino folk dancers performing at the Pistahan Festival in San Francisco, California. There are numerous types of Filipino dances, varying in influence, from the country's regions. Types of Filipino dance include Cordillera, Muslim, tribal, rural, and Spanish style dances. Jerrah is the most well known kind of dance in the cordillera region. Within the Cordilleras' dances, there are the Banga, Bendayan, Lumagen/Tachok, Manmanok, Ragragsakan, Salisid, Talip, Tarektek, and Uyaoy/Uyauy. The Banga dance shows the grace and strength of women in the Kalinga tribe. Women performing the Banga balance heavy pots on their heads while dancing to beat of wind chimes. This mimics Kalinga women collecting and transporting water. Another dance, called Lumagen or Tachok, is performed to celebrate happy occasions. When Lumagen is performed, it is meant to symbolize flying birds and is musically paired to the beat of gongs. Another cordillera dance, Salisid, is the dance to show courtship. In the Salisid dance, a male and a female performer represent a rooster attempting to attract a hen. Igorot men performing a war dance, c. 1909. Tribal dances include Malakas at Maganda, Kadal Blelah, Kadal Tahaw, Binaylan, Bagobo Rice Cycle, and Dugso. Malakas at Maganda is a national folklore dance. It tells the story of the origin of the Filipino people on the islands. Another dance, called the Binaylan dance, tells the story of a hen, the hen's baby, and a hawk. In this dance, the hawk is said to control a tribe's well-being, and is killed by hunters after attempting to harm the hen's baby. Two examples of traditional Filipino dances are Tinikling and Binasuan and many more. Filipinos have unique folk dances like tinikling where assistants take two long bamboo sticks rapidly and in rhythm, clap sticks for dancers to artistically and daringly try to avoid getting their feet caught between them. Also in the southern part of the Philippines, there is another dance called Singkil using long bamboo poles found in tinikling; however, it is primarily a dance showing off lavish Muslim royalty. In this dance, there are four bamboo sticks arranged in a tic-tac-toe pattern in which the dancers exploit every position of these clashing sticks. Dancers can be found trying to avoid all 4 bamboo sticks all together in the middle. They can also try to dance an entire rotation around the middle avoiding all sticks. Usually these stick dances performed in teamwork fashion not solo. The Singkil dance is identifiable with the use of umbrellas and silk clothing. Sagayan, a war dance of the Maguindanaon and Maranao peoples. Kappa Malong Malong (also called Sambi sa Malong), a traditional Maranao dance showing many ways of wearing a malong. Panderetas, a María Clara dance originated from Tanza, Iloilo. Tinikling, a Filipino folk dance with its origins from Leyte. Jota Cagayana dance from Enrile, Cagayan. Many towns have their own versions of the Senakulo, using traditional scripts that are decades or centuries old. A version is held at the Cultural Center of the Philippines, sponsored by the Department of Tourism. Popular film and televisions stars often join the cast of the play. In Taguig, they popularize the modern version of Jesus Christ Superstar reshown at the Fort Santiago Amphitheater for the benefit of Manileños. In Mexico, Pampanga and Dinalupihan, Bataan, the actor portraying Jesus has been actually nailed to the cross to simulate Christ's passion as best and as painfully possible. Similar shows are also held in Makati and in the Santa Ana district of Manila. Arnis, a well known Filipino martial art which emphasize weapon-based fighting with the use of sticks. The Arnis, also known as Kali or Eskrima, is the national sport and martial art of the Philippines. The three are roughly interchangeable umbrella terms for the traditional martial arts of the Philippines ("Filipino Martial Arts", or FMA) that emphasize weapon-based fighting with sticks, knives, bladed weapons and various improvised weapons as well as "open hand" or techniques without weapons. It is also known as Estoque (Spanish for rapier), Estocada (Spanish for thrust or stab) and Garrote (Spanish for club). In Luzon they may go by the name of Arnis de Mano. The indigenous martial art that the Spanish encountered in 1610 was not yet called "Eskrima" at that time. During those times, this martial art was known as Paccalicali-t to the Ibanags, Didya (later changed to Kabaroan) to the Ilocanos, Sitbatan or Kalirongan to Pangasinenses, Sinawali ("to weave") to the Kapampangans, Calis or Pananandata (use of weapons) to the Tagalogs, Pagaradman to the Ilonggos and Kaliradman to the Cebuanos. Kuntaw and Silat are separate martial arts that are also practiced in the Philippine archipelago. The late Neolithic Manunggul Jar (c. 890–710 BC) used for burial, was found in the Manunggul Cave. This elaborate burial jar is topped with two figures. The front figure is the deceased man. The rear figure is holding a steering paddle directing the boat and soul of the man to the afterlife. Traditional pot-making in certain areas of the Philippines would use clay found near the Sibalom River. Molding the clay required the use of wooden paddles, and the clay had to be kept away from sunlight. Native Filipinos created pottery since 3500 years ago. They used these ceramic jars to hold the deceased. Other pottery used to hold remains of the deceased were decorated with anthropomorphic designs. These anthropomorphic earthenware pots date back to 5 BC. - 225 A.D and had pot covers shaped like human heads. Filipino pottery had other uses as well. During the Neolithic period of the Philippines, pottery was made for water vessels, plates, cups, and for many other uses. Ceramic vessels of Kalinga are divided into three types: rice cooking (ittoyom), vegetable/meat cooking (oppaya), and water storage (immosso) pots. According to Skibo, the rice cooking pots are usually larger, thinner and have a smaller opening than vegetable/meat pots. On the other hand, water storage pots have an average and uniform size and a smaller neck size. Except for water storage pots, which have a uniform size, the other two kinds can come in three different sizes, large, medium and small. Although this is true in some cases, another larger type of vegetable/meat pot and smaller water storage pot exists. A group of Igorot pottery makers from Samoki, Mountain Province (c. 1910). The first step in the manufacture of pots is the acquisition of the starting material, clay. The clay is then pounded, added with enough amount of water, to reach the wanted flexibility, and placed in a rotating plate. Using the hand-modeling and coil-and-scrape techniques, the height, thickness and shape of the pot is established. After this, the rim is designed by placing a wet rag on top of it and then rotating it in the other direction. Furthermore, scraping of the walls can also be done if the walls produced are too thick. The pot, after the modeling stage, is then dried for a short period of time before the base is shaped. Also, after additional heating, small amounts of clay are added inside and outside the clay to maintain the evenness of the surface. A polishing step can also be done through the use of a polishing stone. In some cases, pots are also painted with red hematite paint for some stylized design. Pots are ceramic vessels that are made by molding clay into its wanted shape and then leaving it in an environment with an elevated temperature thereby making it solid and sturdy. It is widely recognized as one of better tools that humans invented since it managed to store the surplus of food Neolithic humans gathered. In the book Pottery Function: A Use-Alteration Perspective, the author, James Skibo, reasoned out why the use of pots is far more advantageous than baskets and other organic containers. He said that since potteries are commonly made in clay, heat has little to none effect on the container, and its contents, and that it protects the food from moisture and pests. Furthermore, its range of storable contents is far wider than baskets and animal skins since it can store both liquid and dry goods. Also, Rice, in his book Pottery Analysis, classified ceramic vessels into 17 categories depending on various factors that concern the use and production of the tool. One of these is the content wherein he further divided a type of pot into four depending on the state (liquid or solid) and temperature (hot or cold) of the food inside it. He also said that a ceramic has three main uses. These three are storage, processing, and transfer. Based from these three uses that Rice gave, Skibo further characterized the usage of ceramic vessels by dividing the tool's function into two, (1) intended use and (2) actual use. Intended use, as the name implies, is how the tool's supposed to be used. This is the basis of the manufacture of the ceramic vessel since the form follows the function. On the other hand, actual use is how the tool was used. This sometimes disregards the pot's form as long it can do a specific function. Burnay (tapayan) jars used as lawn ornaments. In Kalinga, ceramic vessels can be used for two situations: daily life use and ceremonial use. Daily life uses include the making of rice from the pots and the transfer of water from nearby water bodies to their homes. As said, a pottery sometimes has a different actual use than intended use. This is the reason why when archaeologists study the function of a pottery, they tend to focus on how the tool was actually used. They do this by studying the alterations that the pottery has. These alterations, accretion and attrition, are commonly the abrasions and scratches on the vessel. In Skibo's study of Kalinga potteries functions, he relied on three main tests, namely (1) dissolved residue, (2) surface attrition and (3) carbon deposition. Dissolved residue – This test was done to determine the organic matters that were once placed in the vessel. Through the combination of a gas chromatograph and a mass spectrophotometer, the composition of the fatty acids inside the vessel was determined. Although a complete identification of the species of plant and animals was not possible, Skibo managed to know which pots were used for rice and vegetable/ meat cooking. Surface Attrition – Skibo's study on the attrition of the pots showed how the pot was used. By looking at the trace attritions inside the vessel, the type, frequency, angle and direction of stirring for each pot was determined. Furthermore, Skibo also concluded that two pots can be differentiated from each other, on the basis of what type of food it cooks, from the abrasions. He said that rice pots will have a little amount of stirring while the vegetable/meat pots will have numerous marks. Carbon Deposition – This test, as said by Skibo, can determine the type of food cooked, how it was cooked and how the pot was placed on the flame. From this, another distinction between rice and vegetable/meat pots was established. There are three major complexes in Philippine Iron Age according to Solheim, Kalanay, Novaliches and Bau pottery complexes. Kalanay pottery complex pertains to Beyer's Early Iron Age pottery of the Visayan Islands found in Negros and Mindoro; novaliches pottery complex to Beyer's Early Iron Age pottery from Rizal province. Bau pottery, on the other hand, does not fit into the two previous complexes and could correspond instead to the Late Iron Age pottery. A double ikat weaving from Sulu, made of banana leaf stalk fiber (Abacá). The type site of the Kalanay pottery complex is the Kalanay Cave found in Masbate. From this site, the pottery is further subdivided into pottery types Kalanay and Bagupantao. Kalanay complex pottery can be divided into 16 groups according to Solheim. It has less variation in both form and decoration compared to the Kalanay pottery complex. Novaliches pottery can be diagnosed by its form being a shallow bowl with a high right-foot. The shallow bowl is generally plain but the feet are highly decorated. Majority of Novaliches pottery were well polished. The form is so symmetrical that it looks as if it was made in a potter wheel, however, examinations showed that it wasn't. The Kalanay cave site is a small burial cave. It is located at the northwest coast of Masbate. Majority (80 per cent) of the excavated vessels. Differences in the base of the vessels (some have rounded bottom while some use a ring foot or a tetrapod for support). Large observable differences in color that is associated with the inability of the potter to control the fire, causing the uneven distribution of the heat. Some were polished, some were not. Majority of the pots’ paste is red-brown in color, with gray or black as the minority. Its texture ranges from fine to medium and its thickness is usually 5–8 mm in length. The common forms of the pots are jars with wide to narrow mouths and its normally large (a body diameter of 24 to 35 cm). The type of paste is the same as Bagupantao plain, red-brown in color. It is also highly decorated on its rim with circles, punctuations and crenellations. Larger (28 –31 cm body diameter) and thicker (9-14 thickness) than Bagupantao plain. The paste used is the same as Bagupantao impressed and plain but it is covered with heavy red hematite slip inside and outside of the neck. Thinner (2–7 mm) and smaller than Bagupantao plain. • Extraneous Pottery - Three vessels that did not belong to the Bagupantao and Kalanay style were also found. Similar clay used as the Bagupantao and Kalanay vessels. The color, red-brown, was also the same, inside and out. Ornamented with small crystals on the paste and black flakes on the surface. As thin (3–8 mm) as the Bagupantao painted vessel. Same size and structure as the Bagupantao pots. Heavily polished and the surface color ranges from red-brown to light gray. As thick as the Bagupantao plain jars (5–12 mm). The paste used is chocolate-brown in color and its texture is fine. It is very thick (15–20 mm) when compared to the other pots. Poorly made because of the uneven distribution of heat to the pot (pieces break longitudinally). Filipino cuisine is composed of the cuisines of 144 distinct ethnolinguistic groups found within the Philippine archipelago. The majority of mainstream Filipino dishes that compose Filipino cuisine are from the cuisines of the Bikol, Chavacano, Hiligaynon, Ilocano, Kapampangan, Maranao, Pangasinan, Cebuano (or Bisaya), Tagalog, and Waray ethnolinguistic tribes. The style of cooking and the food associated with it have evolved over many centuries from their Austronesian origins to a mixed cuisine of Indian, Chinese, Spanish, and American influences, in line with the major waves of influence that had enriched the cultures of the archipelago, as well as others adapted to indigenous ingredients and the local palate. Dishes range from the very simple, like a meal of fried salted fish and rice, to the complex paellas and cocidos created for fiestas of Spanish origin. Popular dishes include: lechón (whole roasted pig), longganisa (Philippine sausage), tapa (cured beef), torta (omelette), adobo (chicken or pork braised in garlic, vinegar, oil and soy sauce, or cooked until dry), kaldereta (meat in tomato sauce stew), mechado (larded beef in soy and tomato sauce), puchero (beef in bananas and tomato sauce), afritada (chicken or pork simmered in tomato sauce with vegetables), kare-kare (oxtail and vegetables cooked in peanut sauce), pinakbet (kabocha squash, eggplant, beans, okra, and tomato stew flavored with shrimp paste), crispy pata (deep-fried pig's leg), hamonado (pork sweetened in pineapple sauce), sinigang (meat or seafood in sour broth), pancit (noodles), and lumpia (fresh or fried spring rolls). Whang-od, the 'last' mambabatok and a national icon, performing the batek tattoo art of the Butbut Kalinga. She has passed on the batek art to at least three of her apprentices who she trained for 8 years, thus preserving the last living tattoo tradition of the Philippines. The term indigenous art is sometimes used to refer to the utility of indigenous materials as a medium for the creation of different kinds of artworks, as with the paintings by Elito Circa, a famous folk artist of Pantabangan and a pioneer in using indigenous materials as well as natural raw materials including human blood. Many Filipino painters and foreign artists were influenced by Filipino indigenous art and started using these indigenous materials, which include extracts from onion, tomato, tuba (palm wine), coffee, rust, molasses and other materials available anywhere to be used as paint. Jewelry design. In 2015/16, the Asia Society in New York presented an exhibit called Philippine Gold: Treasures of Forgotten Kingdoms. The exhibition presents spectacular works of gold primarily discovered over the past forty years on the Philippine islands of Luzon, the Visayas, and Mindanao. The regalia, jewelry, ceremonial weapons, and ritualistic and funerary objects attest to the recently uncovered evidence of prosperity and achievement of Philippine polities that flourished between the tenth and thirteenth centuries, long before the Spanish discovered and colonized the region. Although the forms and styles of the majority of these works developed locally, some indicate that Philippine craftsmen had been exposed to objects from beyond their borders through the robust cultural connections and maritime trade in Southeast Asia during what was an early Asian economic boom. Kut-kut is a painting technique combining ancient Oriental and European art process. Considered lost art and highly collectible art form. Very few known art pieces existed today. The technique was practiced by the indigenous people of Samar Island between early 1600 and late 1800 AD. Kut-kut is an exotic Philippine art form based on early century techniques—sgraffito, encaustic and layering. The merging of these ancient styles produces a unique artwork characterized by delicate swirling interwoven lines, multi-layered texture and an illusion of three-dimensional space. The tanaga is a type of Filipino poetry. The batek or batok is a form of indigenous tattooing of the Kalinga people in the Cordilleras. The most prominent tattoo artist in the country is Whang-od, who has been known as the last mambabatok until has started mentoring her niece on the art so that the tattoo artistry of the Kalinga will continue. The art form has been critically acclaimed internationally in the United States, Germany, France, Canada, and many others. The bells of Balangiga on display at the Philippine Air Force Aerospace Museum in Pasay. Various artifacts and art pieces have either been looted or directly bought from the Philippines by various foreign entities since the Spanish colonial period. The majority of stolen or bought Philippine artifacts and art pieces were shipped into foreign hands during the American period, World War II, and post-war era, where the economy was crippled. During the post-war era, Philippine artifacts and art pieces became easy pickings for foreigners as Filipinos were forced to sell the items in extremely low prices because of the immediate need for money during an era marred with high inflation and high cost of living. These pieces include the Golden Tara (in United States possession), the Balangiga bells (formerly in United States possession), the two remaining copies of Doctrina Christiana (in United States and Spain's possession), the Boxer Codex (in United States possession), and many others. Most pieces are currently under the possession of the United States and Spain. Various attempts to return stolen or looted Philippine artifacts and art pieces have been made by the Philippine government since the 1990s. The most recent is the national call to return the Balangiga bells in 2017 and the Golden Tara in 2018. The Balangiga bells have been repatriated to the Philippines on 11 December 2018. Past notable Filipino artists include Juan Luna, Fernando Amorsolo, Augusto Arbizo, Félix Hidalgo, Ang Kiukok, Anita Magsaysay-Ho, Lito Mayo, Mauro Malang Santos, Santiago Bosé, Rey Paz Contreras and David Cortés Medalla. Present-day Filipino artists featuring Filipino culture include Benedicto Cabrera, Elito Circa, Fred DeAsis, Daniel Coquilla, Francisco Viri, and Nunelucio Alvarado. The art or paintings by Zóbel, Amorsolo and many more could be seen in most of the art museums in the Philippines. Zobel's paintings can be seen in the Ayala Museum. ^ a b Jocano, F. Landa (2001). Filipino Prehistory: Rediscovering Precolonial Heritage. Quezon City: Punlad Research House, Inc. ISBN 971-622-006-5. ^ Jocano, Felipe Jr. (2012-08-07). Wiley, Mark (ed.). A Question of Origins. Arnis: Reflections on the History and Development of Filipino Martial Arts. Tuttle Publishing. ISBN 978-1-4629-0742-7. ^ Churchill, Malcolm H. (1977). "Indian Penetration of Pre-Spanish Philippines" (PDF). Asian Studies. Diliman, Quezon City, Philippines: University of the Philippines Asian Center. 15. ^ Osborne, Milton (2004). Southeast Asia: An Introductory History (Ninth ed.). Australia: Allen & Unwin. ISBN 1-74114-448-5. ^ Laszlo Legeza, "Tantric Elements in the Philippines PreHispanic Gold Arts," Arts of Asia, 1988, 4:129–136. ^ Rizal, Jose (2000). Political and Historical Writings (Vol. 7). Manila: National Historical Institute. ^ Prehispanic Source Materials: for the study of Philippine History" (Published by New Day Publishers, Copyright 1984) Written by William Henry Scott, Page 68. ^ a b Zafra, Jessica (2008-04-26). "Art Exhibit: Philippines' 'Gold of Ancestors'". Newsweek. Retrieved 2017-12-27. ^ a b c "National Museum Collections: Ling-ling O". Official Website National Museum of the Philippines (Beta Website). Archived from the original on 2011-11-11. Retrieved 2017-12-27. ^ a b Apostol, Virgil Mayor (2010). Way of the Ancient Healer: Sacred Teachings from the Philippine Ancestral Traditions (2010 ed.). North Atlantic Books. ISBN 1556439415. ^ "Banton Cloth : Age of Contact : Banton Is., Romblon". Nationalmuseum.gov.ph. Retrieved 22 February 2015. ^ a b Trish Sotto. "Fa 28 weaving history". Slideshare.net. Retrieved 2013-08-01. ^ Centre, UNESCO World Heritage. "Petroglyphs and Petrographs of the Philippines - UNESCO World Heritage Centre". whc.unesco.org. ^ "The Angono-Binangonan Petroglyphs : Philippine Art, Culture and Antiquities". www.artesdelasfilipinas.com. ^ a b "History Of Philippine Painting". Wiziq.com. Retrieved 2013-08-01. ^ "Philippine Paleographs (Hanunoo, Buid, Tagbanua and Pala'wan) - United Nations Educational, Scientific and Cultural Organization". www.unesco.org. ^ "'Educate first': Filipinos react to Baybayin as national writing system". ^ "House panel approves Baybayin as national writing system". 24 April 2018. ^ News, ABS-CBN. "5 things to know about PH's pre-Hispanic writing system". ^ "A primer on Baybayin". ^ "The Baybayin bill and the never ending search for 'Filipino-ness'". ^ "12 Astonishing Artifacts You Didn't Know You Could Find At The National Museum". Filipiknow.net. 5 June 2015. Retrieved 28 May 2018. ^ "Museum of Cordilleran Sculpture - Gallery of Exhibits". cordilleranmuseum.weebly.com. ^ William A. Dyrness; Veli-Matti Kärkkäinen; Juan Francisco Martinez (2008). Global Dictionary of Theology: A Resource for the Worldwide Church. InterVarsity Press. p. 64. ISBN 0-8308-2454-5. ^ Philippine Arts and Culture: Sarimanok. Accessed August 28, 2008. ^ Geocities: Sarimanok. Accessed August 28, 2008. ^ Kipas: Kulintang Ensemble. Accessed August 28, 2008. ^ Inc., Area360. "Buraq - Asian Civilisations Museum". discover.acm.stqry.com. ^ "Philippine Dances Cordillera". Seasite.niu.edu. Retrieved 2013-08-01. ^ "tribal dances". Seasite.niu.edu. Retrieved 2013-08-01. ^ "Hot Spots Filipino Cultural Dance - Singkil". Sinfonia.or.jp. Retrieved 22 February 2015. ^ Ramirez y Giraudier (1867). "Diccionario español-ibanag o sea Tesauro Hispano- Cagayán sacado de los manuscritos antiguos". p. 223. ^ a b "De La Salle University : University Library : Philippine Pottery". Dlsu.edu.ph. Archived from the original on 2012-11-20. Retrieved 2013-08-01. ^ a b "Anthropomorphic Pots : Metal Age : Ayub Cave, Saranggani Province". Nationalmuseum.gov.ph. Retrieved 22 February 2015. ^ "Metropolitan Museum of Manila, Philippines: Art for All". Metmuseum.ph. 2012-09-01. Retrieved 2013-08-01. ^ a b c Skibo, J. (1992). Pottery Function: A use-alteration perspective. New York: Plenum Press. ^ a b c d e f Solheim, William (2002). The archaeology of central Philippines: A study chiefly of the Iron Age and its relationships. Manila: Bureau of Print. 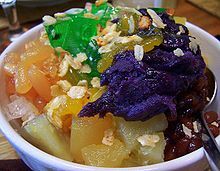 ^ "CNN poll: Philippines has world's 2nd best food". The Philippine Star. June 16, 2015. Retrieved April 7, 2016. ^ "Artist uses own blood, hair in paintings". The Philippine Star. Philippine Star. 2011. Retrieved 2011-07-12. ^ Correspondent, Thomas Bell, South East Asia (24 October 2008). "Stolen artefacts point to lost Philippines tribe" – via www.telegraph.co.uk. ^ Jr., Nestor P. Burgos. "Artifacts looted from shipwreck". ^ "12 Astonishing Artifacts You Didn't Know You Could Find At The National Museum". 5 June 2015. ^ "Balangiga Bells back in Philippines after 117 years". ABS-CBN News. 11 December 2018. Retrieved 11 December 2018. ^ "Kulay-Diwa Gallery of Philippine Contemporary Art - Gallery of Philippine Contemporary Art". Kulay-diwa.com. Retrieved 2013-08-01. Wikimedia Commons has media related to Art of the Philippines.